We offer first-class training and working conditions and the possibility to do your IDC, EFR instructor & IE as a Scuba Diving Internship. This is also your chance to gain more training and work experience in a busy dive center. 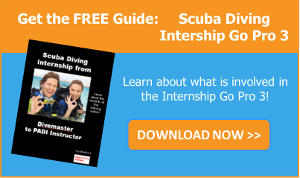 Scuba diving internship means the exchange of services without any direct cash flow. You will collaborate with us for about 5 ½ months and in exchange of it we will cover the expenses for your IDC, EFR instructor and IE. This time span could also be shortened. Ask us for more details.